In 1862, at the height of the Civil War, a woman named Sarah Pardee married William Wirt Winchester, son of Oliver Winchester, creator of the Winchester repeating rifle, and heir to his fortune. They lived happily in New Haven, Connecticut, and four years later, on July 15, 1866, Sarah gave birth to a little girl whom she named Annie. Unfortunately, the child contracted "marasmus" disease and died a short time later on July 24. Quite obviously, Sarah was devastated. Teetering on the brink of madness over the death of her only child, Sarah nearly broke down when years later on March 7, 1881 her husband William died of pulmonary tuberculosis. Upon his death, Sarah inherited over $20 million and 48.9% of the Winchester Repeating Arms Company, totaling approximately $1,000 per day. A while later, Sarah met with a Spiritualist medium who told her that because the Winchester bloodline was responsible for creating a weapon of destruction, the family was cursed, and that is why William and Annie died. The spirit of every person who had ever been killed by a Winchester rifle was now seeking revenge. The medium, who would later come to be known as the "Boston Medium" then advised Sarah to sell her home in Connecticut and move west. She was told to build a new home to appease the spirits and give them shelter. "You can never stop building the house," the medium warned. "If you continue building, you will live. Stop and you will die." Sarah ended up in the Santa Clara Valley, California where she found a six-room house that was still under construction. She purchased the house from a Dr. Caldwell and began building. She kept building for the next 36 years, drawing on her immense fortune to keep the never-ending project funded. For 24 hours a day, a team of 22 carpenters worked non-stop. She would hire them to build a section just to knock it down later and build it again. Rooms were added one after another until they formed entire wings, doors connected to windows and elevators were installed along with 47 fireplaces. Trap doors, upside-down stair posts, hallways that doubled back on themselves and doors that opened up into midair above the lawn were just some of the oddities included in the strange house's design. Obsessed with spider web motifs and the number 13, Sarah made sure all the windows contained 13 panes of glass, the greenhouse had 13 cupolas and the staircases had 13 steps. Sarah believed that by controlling the layout of the house she could control the spirits who she believed inhabited it. The twisty, maze-like design was intended to confuse the evil spirits. By 1906 the home was seven stories tall. It was also in this year that the great San Francisco Earthquake struck. The top three floors collapsed into the garden, and after being trapped under a fireplace herself (it had shifted during the quake), Sarah boarded up the front 30 rooms in an attempt to trap the spirits who had fallen when that part of the house collapsed. Construction continued on and on and on, until Sarah's death on September 4, 1922 at the age of 83. By this time, she had been building the house nonstop for 38 years, and during that whole time the workmen had not been given a single day's rest due to Sarah's incessant fear that she would die if the building stopped. The first day the workers had ever been given off was the day she died. The house was willed to Sarah's niece, France Marriot. At five stories tall, the house was originally thought to contain 148 rooms. A recount determined that there were actually 160, including 40 bedrooms, 2 ballrooms, 17 chimneys, 10,000 windows and two basements.. Today, Winchester Mansion, located at 525 South Winchester Blvd., is an Historic Landmark in the state of California described as a "large, old dwelling with an unknown number of rooms." Sitting on 4.5 acres of land the house has several different tours available to the general public, including a flashlight tour each Halloween and every Friday the 13th. 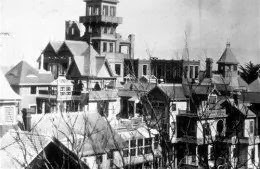 As for it's haunted history, there is no evidence that the mansion was in fact haunted during the time Sarah Winchester was frantically building. What has happened after her death, however, is a different story. Two tour guides and several guests have spotted a construction worker with distinct mustache wearing overalls and pushing a wheelbarrow. Upon being shown the photo of Mrs. Winchester's construction crew, one of the guides identified the man to the far right as the man seen throughout the grounds and in the basement. Banging doors, strange footsteps, eerie voices and cold spots are all common occurrences at the Winchester Mansion, but it's far more likely that, rather than spirits, it is Sarah Winchester herself who is haunting the home now.